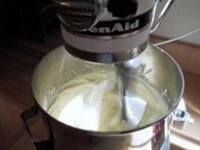 To make the crust, place the butter, brown sugar, flour and nuts in the bowl of a food processor. Blend until combined well. Reserve 3/4 cup of the crust mixture to use on top of the cookies and press the rest into a 9-inch square baking dish or a quarter-sheet pan with sides (note: cookies baked in a quarter-sheet pan will be thinner). 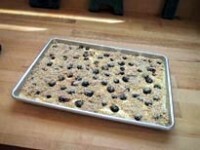 Bake the crust in the preheated oven for 10 to 12 minutes, or until lightly browned. Remove from the oven and reduce the oven temperature to 350 degrees. Meanwhile, make the filling. 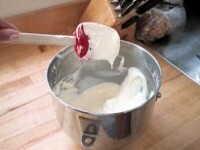 In the bowl of an electric mixer, beat the sugar and cream cheese until well combined and fluffy. Add the egg, milk, lemon juice and vanilla and beat at high speed for 3 to 5 minutes, scraping down the sides occasionally, until the mixture is smooth with no lumps. 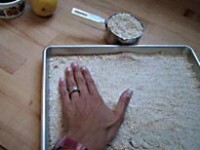 Pour the filling mixture over the baked crust and gently spread it to cover in an even layer. 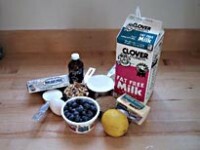 Scatter the blueberries over the filling and the sprinkle the remaining crust mixture over the top. Bake in the 350 degree oven for 20 minutes, or until the filling is just set and slightly puffed. Cool the cookies completely on a rack. Place the cooled cookies in the refrigerator for at least two hours before cutting. 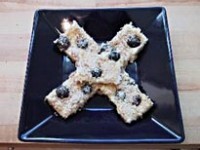 Cut into bars and serve. Cookies and be tightly wrapped and frozen for up to two weeks or left, wrapped, in the refrigerator for up to five days.